Immersive combat. Satisfying crafting mechanics and stat building. Absolute eye-candy. Phenomenal story and solid interpretation of the Norse Mythology. The God of War franchise is a brutal, mythologically-fueled, hack-n-slash PlayStation Exclusive from Sony Santa Monica Studio which debuted back in 2005 for the PlayStation 2. It was known for it’s over the top action (both literally and figuratively) and intensely brutal interpretation of Greek mythology. 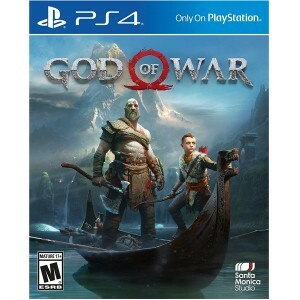 The franchise was able to spawn several games across two console generations, coming out with a couple of them on PlayStation Portable and even one in the mobile platform (God of War: Betrayal). God of War takes place sometime after the events of God of War III. 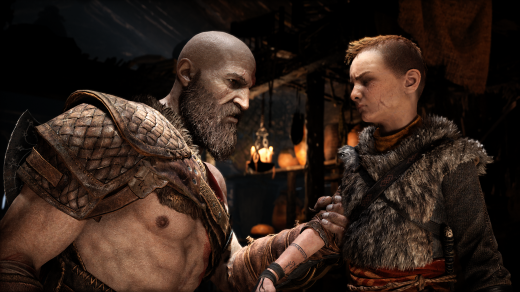 Kratos is much, much older now and has a new kid—a boy named Atreus who’s as much the protagonist of the story as Kratos is. 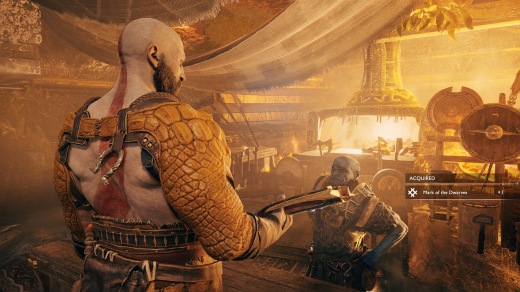 The game plays around the idea of Kratos post-godly-genocide and explores his second-attempt at a normal life. 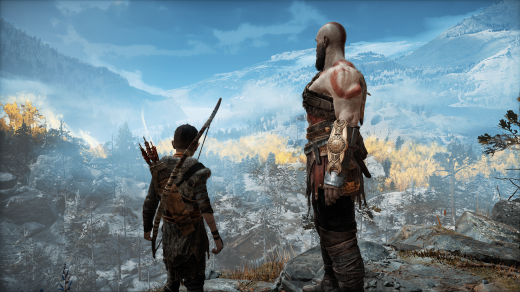 Beginning with the death of Kratos’ second wife, he and his son embark on a journey to the highest peak to scatter her ashes as a final request. Naturally, things do not go smoothly for the Spartan, struggling to protect his son as well as his secrets. It’s interesting to see this god-killing fury machine struggle with something so daunting as fatherhood. But what’s even more surprising is how well he and Atreus fit in this new Norse Mythology setting. I can not stress how much I like God of War’s take on the whole Norse Mythology. It does a great job getting you invested no matter the level of your familiarity with the Norse mythos. There wasn’t a single dull moment throughout the entire main campaign. Especially between fights when there’s nothing going on. Because this is usually when all the quips, stories, and father and son dialogue come into play. There’s a metric ton of lore surrounding the Norse mythology so don’t expect much of them to be involved in the main plot. That being said, there are lots of interesting references and stories to be found and heard throughout the 30+ hours or so of gameplay. Despite being flung to an entirely new mythology, the setting isn’t what separates it the most from previous God of Wars. The combat system has had a major overhaul, electing for an over the shoulder perspective as opposed to the staple isometric fixed camera angles from past titles. Kratos’ weapons of choice have changed as well, forcing Kratos to fight more personal battles with his Leviathan Axe. Personal doesn’t necessarily mean close, as Kratos can also hurl his Axe at distant enemies —complimented by its convenient ability to be recalled back to Kratos at will, similar to Thor’s Mjolnir. His Leviathan Axe can lodge into an enemy’s body and become frozen, at which point Kratos has access to a barehanded move set utilizing his fists and a retractable shield that can be used to block and parry incoming blows. Kratos’ son, Atreus, isn’t at all useless in combat as many of us might have thought he would be. Sure, he may start off with very limited capabilities, but he quickly catches on and actually becomes invaluable to Kratos in combat. Kratos’ and Atreus’ combat synergy puts Joel and Ellie’s to shame. You can choose to command Atreus to fire his arrows on a target with the square button. But even if you don’t, he remains autonomous and helps out Kratos to the best of his abilities. 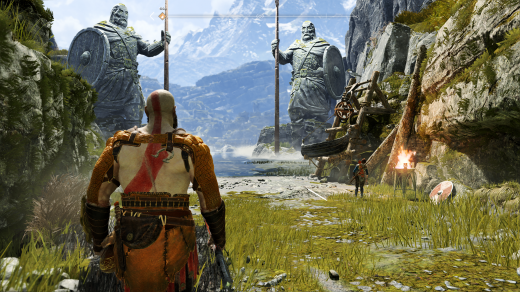 Technically speaking, God of War’s combat isn’t really that far removed from previous God of War games, but the new perspective and combat system added a significant amount of depth and immersion that previous God of War games didn’t have. From start to finish, each encounter almost always forced me to think on my feet, which I found immensely satisfying. In fact, even exploration is more rewarding this time around. 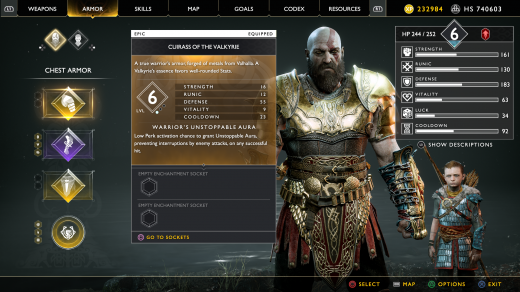 Kratos will come across all manner of items as he goes along, ranging from pieces of armor to enchantments that improve Kratos’ attributes and provide active/passive abilities. Kratos will also happen upon resources which he can then use to craft stronger equipment and/or upgrade them. Kratos’ has attributes akin to that of a typical RPG game: Strength increases his normal attacks’ damage, Defense reduces the damage he receives, Luck increases the activation chance of his passive abilities, Cooldown reduces Runic attack cooldowns and so on. Improving these attributes increases his Power Level, which represents how strong he is when compared to an enemy’s own Power Level. Trying to fight enemies that have a higher Power Level than Kratos can be quite tricky and with limited funds and materials especially early on, you’d do best to spend them wisely on lasting equipment. Thankfully the game does well to encourage and incentivize you to explore the many areas around GoW’s large interconnected world outside of the main campaign. It’s a fantastic way to learn more about the mythos and also to strengthen Kratos’ Power Level. There’s still a bit of puzzle solving here and there but nothing so complex that it would pull you out of the immersion. There also aren’t a lot of variety in terms of enemy types but they throw enough variation of enemy groups that the game seldom felt repetitive if not at all. 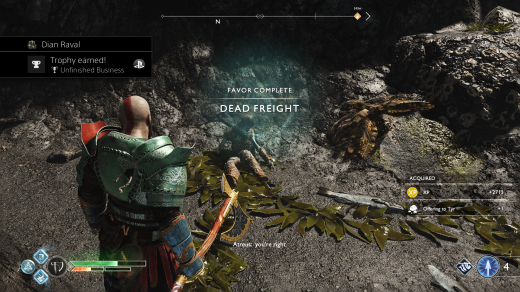 This is largely thanks to Kratos’ vast moveset and the game’s satisfying combat flows. There’s a ton of activities and distractions beyond the standard campaign, which, by the way, takes somewhere between 20-30 hours of playtime to finish. 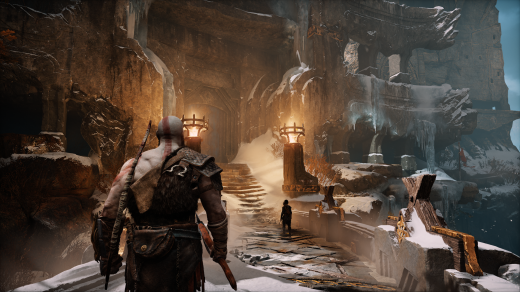 This may come as to no surprise to some of you as it has become somewhat of a standard for first-party PlayStation titles, but God of War looks absolutely phenomenal. I have nothing bad to say about the visuals. What I loved the most about it is that everything looks like it’s been sculpted by hand. No rock formation and shrubbery looked at all the same. No obvious repeating textures and/or resources either, despite my relentless search for ‘em. Everything looks so detailed, down to the last strand of hair in Kratos’ beard. I’m not even kidding, the added photoshop mode allowed me to zoom right in there and found absolute tranquility. The game also offers two graphical options for those rocking the PS4 Pro: A resolution mode and a performance mode(fps). But those with the standard PS4 need not worry because I reviewed the game on a standard PS4 and it still runs like a million bucks. God of War is also very immersive. Even normal encounters sometimes look and feel very cinematic. The particle effects are all very spectacular and even the controller vibrations were somehow done so well that you can really feel the impacts as you pummel everything that moves. The game is almost worth getting for the graphics alone. God of War is a masterpiece of a single-player action game. It has revitalized the franchise in a way that can be appreciated by fans and first-timers alike. It somehow succeeded in creating a fresh new experience without losing or compromising the God of War feel. It’s a singleplayer title that can easily pull you in for hundreds of hours without losing momentum. This is no mere hype. If you’re a proud owner of a PlayStation 4, you’d be doing your console, and yourself, a disservice if you let this solid 2018 GOTY contender slip by. Assassin’s Creed: Origins Review (PS4) — A Franchise Rejuvenated?